AUSTIN, Texas -- The preliminaries leading into the first major championship of 2016 have offered up some excellent golf, with big-time winners around the globe hoisting trophies and stating their cases. Jordan Spieth won the year's first tournament with ease, and there was the impressive victory in the Middle East by Rickie Fowler. Then Bubba Watson won at Riviera and Adam Scott captured back-to-back titles in Florida followed by Jason Day's victory at the Arnold Palmer Invitational and then his run at the WGC-Dell Match Play Championship. The name missing, of course, is Rory McIlroy. Ranked No. 3 in the world, he is hardly out of the conversation as the Masters approaches, but he is the only player among that esteemed group without a victory this year, a hole he hoped to fill at Austin Country Club. That goal was thwarted Sunday morning when he couldn't overcome Day in the semifinals, losing 1 up to the Australian when on three occasions he missed putts from inside of 8 feet that would have won a hole. McIlroy, 26, was understandably annoyed afterward. 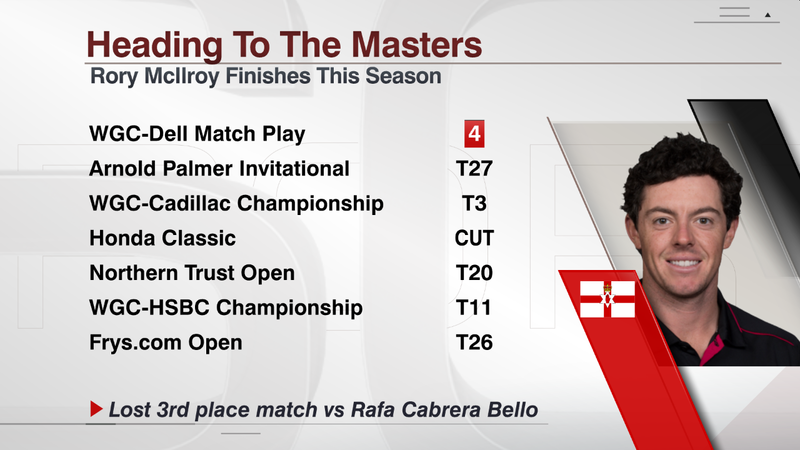 McIlroy will head to Augusta National in a week without the confidence-building victory he sought. And he won't even visit the storied venue this week, opting to practice at home in Florida and arrive on Sunday night. Unlike other years, he has not visited the Georgia course this spring. Perhaps that somewhat different approach is aimed at not getting too amped too early. His counterpart, Day, for example, will arrive in Augusta on Thursday and set up shop across Washington Road from the club, where he'll park his motor home and prepare all weekend away from the crowds. McIlroy's last victory came in November at the DP World Tour Championship, the season-ending tournament on the European Tour. It was a bittersweet season for McIlroy, as he won the European Tour's Race to Dubai, capturing three tournaments on the circuit. One of them was the WGC Match Play, which, added with his victory at the Wells Fargo Championship, gave him two PGA Tour titles. But now there are none in the U.S. since May, and during that stretch Spieth has won four times worldwide, Day has five wins and Fowler has four. That doesn't mean McIlroy won't torch Augusta National and blaze to his fifth major championship. But it seems he needs to get back his knack for scoring. McIlroy, save for the occasional foul ball last week at the Arnold Palmer Invitational, appears to be hitting the ball nicely, powering drives and hitting a high percentage of greens. But he leaves a lot of strokes on the course, and if there are putting issues at Doral and Bay Hill and Austin Country Club, then there are bound to be problems at Augusta National. Undoubtedly, that is the weak spot in McIlroy's game -- he only recently went to a left-hand low method -- that needs some resolution. That said, it's not like he stunk it up Sunday morning or during this tournament. Sometimes you play well and get beat in match play, and that is basically what happened against Day. McIlroy had five birdies and no bogeys and still lost. And for the week, the match-play mentality of feeling like you are in contention from the opening tee shot is one that served McIlroy well. He didn't cruise into the knockout stage, and needed a playoff to advance out of his group. There is some doubt as to whether McIlroy's game is where he wants it. But nobody will remember that uncertainty two weeks from now if he is wearing the green jacket.